Through all the great years of the Good Food Circle in Kinsale it had always puzzled us at Fuchsia why the area remained a blank on our maps of food producers. The gourmet capital of Ireland heaved with culinary talent and energy but you wouldn’t find the name Kinsale in your fridge or cupboard. Gladly in the last 2 years this anomaly has really begun to rectify itself and the key catalyst has been the Tuesday farmers market. This week I met with Iain Flynn of McBride and Flynn, an enterprise that draws together the strengths of the town, pairing the culinary flair of chef Paul McBride with Iain’s skills, appetite for work and determination to succeed. Iain is now working full time in the business and Paul McBride comes in on his days off. 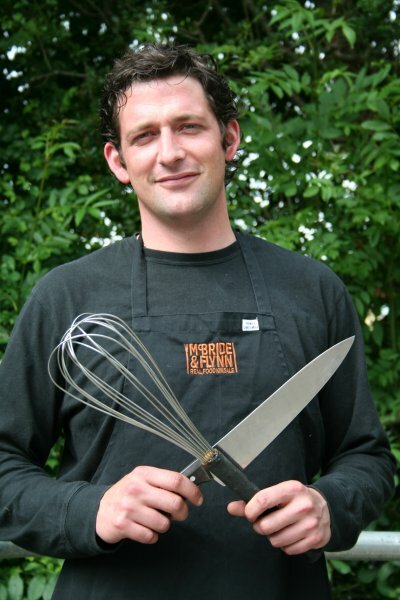 Iain’s passion for culinary learning and discovery is something he says has rubbed off from Paul, who describes his own involvement at the markets as more enjoyable golf. For Paul to have retained the enthusiasm of the hobbyist after decades in commercial kitchens shows a true calling. With this ethos their business will never be about making a quick buck, a motivation that Iain feels has let down most of the local restaurant scene. Iain also has an intuitive understanding of real food from his home life and is not impressed by showiness. “My mother and sister are great cooks and love cooking at home.” In fact, Iain has persuaded his mother to supply their stall with her brown bread, wonderfully enriched with treacle, eggs and oatmeal. Working alone in food preparation can be a lonely business, starting at 6am and sticking to a demanding schedule. So Iain is looking forward to his chance to do some live cooking at the Eat Sherkin festival on the first weekend in July. “It will be fun, as a chef I haven’t cooked live in a while and I know I’ll get a buzz working beside Diane Curtin, she’s such a bundle of energy. We’ll be cooking mackerel landed in the morning and serving them with salad leaves picked around the island, then someone else is bringing their strawberries which we’ll make into a strawberry fool”. The whole event sounds fantastic, there’s no where quite like Sherkin to generate a festive atmosphere. You can read below what Diane Curtin has sent me about the festival weekend and in the meantime take the opportunity to visit Kinsale farmers market which is a bright light in the project to reinvent Ireland’s gourmet capital.